The world's purest baby wipes. 99.9% water & a drop of fruit extract. AllergyUK - Allergy Friendly Product. 2017 Family Choice Award. 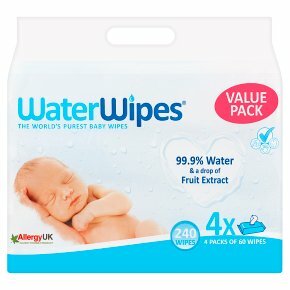 Guidelines for use: WaterWipes are a fresh, pure product. We recommend you store your wipes upside down until opening and open one pack at a time. Use within 4 weeks of opening and reseal the label after every use. Never cut open the individual pack or transfer wipes to another container as the integrity of the product will be compromised and may cause discolouration. Because we don't use chemicals to "bind" the liquid to the wipes, the WaterWipes water can sometimes migrate to the bottom of the pack, making the top wipes feel a little dry. Simply turn the pack over and squeeze a few times to redistribute the water.